November is usually filled with pumpkin spice recipes, but since I’m a rebel <grin>, I thought I’d offer up something different. I made this cake for my husband’s birthday recently and it was a huge hit. Give it a try and let me know what you think. I like a thinner icing so I can smear it over the top and let the icing drip down the sides of the cake. See picture. ***Most grocery stores sell lemon curd in the jelly/jam section. Look on the top shelf, near the specialty jellies. Or you can make you own lemon curd. Either works well in this recipe. 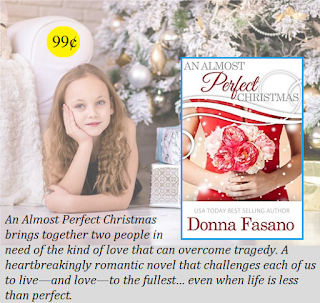 For the month of November, I’m offering An Almost Perfect Christmas for just 99¢ for Kindle. The book is also available at regular price in paperback. USA Today called this book, "...heart-wrenching, sweet, touching, and requires a box of tissues." About the author: Donna Fasano is a USA Today Bestselling Author. Learn more about her on her website. Sign up for her newsletter here. Labels: @Donna Fasano, Dessert Recipes, Donna Fasano, Lemon-Lovers Cake Recipe, What's for Dessert? I love Lemon - this really sounds good - many of the grands want lemon for their birthday as well. Thanks for the recipe, Donna,and for the special offer on your wonderful Christmas book! You're welcome, and thank you for stopping by. The cake looks incredible and it sounds easy to make. I'm definitely going to try it. This recipe sounds delicious. Thanks for sharing, Donna.